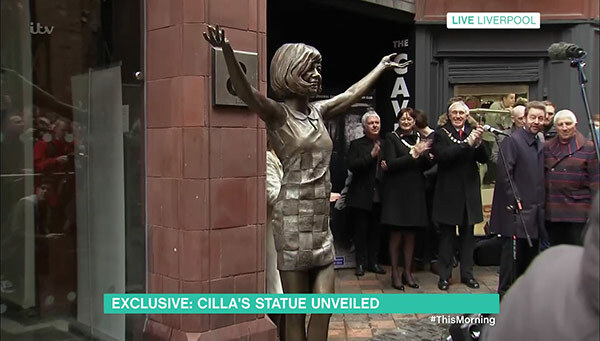 A new statue of broadcasting and music legend Cilla Black has been unveiled live on This Morning. Hosts Phillip Schofield and Holly Willoughby broadcast the scenes live from Liverpool, Black’s hometown, where the statue is situated outside the famous Cavern Club. The statue was commissioned by Black’s sons Robert, Ben and Jack and donated to the city. Black’s son Robert Willis said: “It brings a smile because they’ve caught the joy. We were asked by the Mayor if we wanted to do something, some sort of memorial, and he suggested a statue and we thought that would be very fitting for her. The statue is based on Black’s signature sixties look and her dress even has a few secrets for fans. Willis continued: “It’s based on a sixties design, the dress is chequered and it enabled us to put little stories like photos and lyrics hidden in there for people to check out. According to Willis, Black would have “burst out laughing” at the idea of a statue of herself.